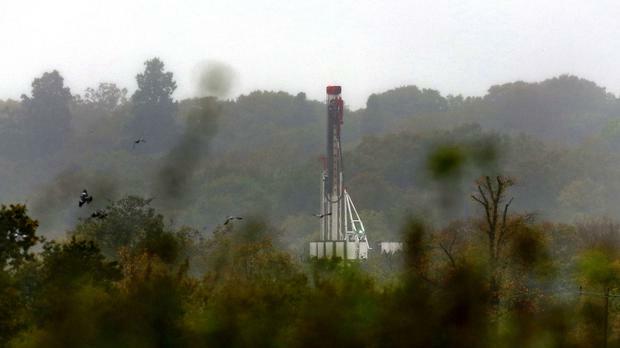 A proposed nationwide ban on fracking has cleared its first hurdle. Cross-party TDs backed legislation put forward by Fine Gael TD for Sligo-Leitrim Tony McLoughlin to outlaw drilling for shale gas from rocks, sands and coal seams across the country. Denis Naughten, Minister for Communications, Climate Action and the Environment, warned that the proposed legislation may not achieve what is intended due to the complexities of gas exploration. But he added: "To be quite clear, there is no great strategic imperative or agenda by Government to pursue the use of fracking." "The primary aim, as legislators, is to ensure that we give proper consideration to the issues and evidence, avoid unintended consequences, and provide legal clarity." Even though the Government tried unsuccessfully to stall the legislation for eight months, potentially delaying an outright ban until 2018, Mr Naughten said it was " another step in protecting Ireland's environment and future". It is understood the minority Government cancelled proposals to stall the legislation until next June after Fianna Fail warned it would support any delay. Mr McLoughlin said agreement on the legislation was "a major win for the environment and for Irish politics". Hydraulic fracturing, commonly known as fracking, involves drilling into the earth before a high-pressure water mixture is forced into rock to release gas. Opponents fear the process can cause earthquakes, pollute water and lead to damaging development in the countryside. Supporters claim it boosts jobs, the economy and energy security. Mr McLoughlin, whose constituency is in one of the three regions identified for potential shale gas exploration, sought to ban energy companies trying to extract raw fuels from shale rocks, tight sands and coal seams. Three exploratory licences were granted in Ireland in 2011 for fracking but no extraction has taken place. The Environmental Protection Agency (EPA) commissioned a report on the impact of the controversial gas extraction on the environment and human health. It is due in the coming months. The proposals to ban fracking will now be passed to an Oireachtas committee for further scrutiny within 12 weeks. Friends of the Earth Ireland described the cross party support for the legislation as " a crucial step to ban fracking". Eamon Scanlon, Fianna Fail TD for Sligo-Leitrim, said: "We were supporting the bill as it was. There was no question about that. "And I would like to see a ban in the next year." Campaigners fighting fracking including the Love Leitrim group were heavily involved in drumming up support for the legislation. Deputy director of Friends Of The Earth Kate Ruddock said: "This isn't just a crucial step towards banning fracking, it is an historic first step towards a fossil free future for Ireland. "It's a tribute to the local campaigners who have worked long and hard to raise concerns about fracking, to their democratic representatives who have responded to those concerns, and to the 2,500 people who emailed their local TDs in the last week asking the to #BackTheBill." Amy Molloy THE OWNER of a Dublin kennel says he wrapped a husky in bin bags after it died to "prevent a dangerous virus wiping out the other dogs in our care". By Cate McCurry, Press Association The gardai failed to achieve over half of its commitments set out in last year’s policing plan, a report has found. By Michelle Devane, Press Association Online job site Indeed has announced plans to hire 600 more staff in Dublin.